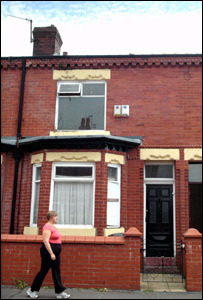 The Queen has turned out to be the new owner of a run-down, rat-infested house in a deprived area of east Manchester. The mid-terraced house in Parkdale Avenue, Gorton, is thought to be worth about £35,000 but has been left derelict for the last 10 years. Housing officers at Manchester City Council traced its owners, but they have no interest in reclaiming it. The property therefore falls to the Duchy of Lancaster, which is controlled by the Queen. The council has written to the Queen's solicitors Farrar & Co in London asking them to take ownership of the property with a view to selling it. The house was owned by a company which had since closed down. When the council traced the son of one of the firm's former directors, he said he had no interest in the property. The house has two bedrooms, two reception rooms, one bathroom and a small back yard. It was passed to the Duchy of Lancaster because of an historic law, dating back to 1399. As Manchester is in the County Palatine of Lancaster, ownership of "disclaimed" houses must automatically pass to the Duchy of Lancaster. The estate and jurisdiction of the duchy remains to the reigning sovereign. The situation could only arise in the County Palatine, an ancient title with royal links. In other parts of England and Wales, the Treasury solicitor handles such cases. Chief executive of the Duchy of Lancaster, Paul Clarke, said any cash raised from the sale of the house would be donated to charities the Jubilee Trust and the Duchy of Lancaster Benevolent Fund.